Our tap water contains chlorine, fluoride, and different amounts of dissolved minerals such as calcium, magnesium, sodium, chlorides, sulfates, and bicarbonates. It can also contain iron, manganese, copper, aluminum, nitrates, insecticides and herbicides. Additionally, according to a report by the Associated Press, that’s the conclusion from a study of 24 municipal tap waters – yes, small quantities of pharmaceuticals — including antibiotics, hormones, mood stabilizers, and other drugs – are in our drinking water supplies. The problem with heavy metals is that they accumulate in the body, causing numerous health problems that can seriously impact literally every major organ in the body. Studies show that heavy metals in the body may be implicated in everything from Alzheimer’s to cardiovascular disease, from behavioral problems to kidney dysfunction, Parkinson’s disease, epilepsy, and even paralysis. Fortunately, the popular herb cilantro has now been found to be an excellent water purifier, absorbing harmful chemicals and heavy metals such as lead and nickel. Cilantro contains chemical agents which bind to toxic metals and they wrest them free from the tissues and flush them out of our body. The secret is that cilantro has special structure of the outer walls of its microscopic cells which comprise the plant. That is why can absorb the heavy metals perfectly. One research that was lead by Douglas Schauer from the Ivy Tech Community College in Lafayette, Indiana along with one group of Mexican researchers proved that cilantro leaves are very cheap way to filter the water mostly in poor regions where the water is not clean. They tested different samples of plants and concluded that cilantro is the most powerful bioabsorbant and prevalent material in Tule Valley in Mexico City. The water in this place is heavily contaminated with nickel and lead. In order to capture the metal toxicity they use typical charcoal which is extremely expensive. “We can get rid of these organic toxins easily using different methods. However, the best way to eliminate them is to use filtering agents such as activated charcoal. However, they can be rather expensive for people who live there.”- said Schauer. 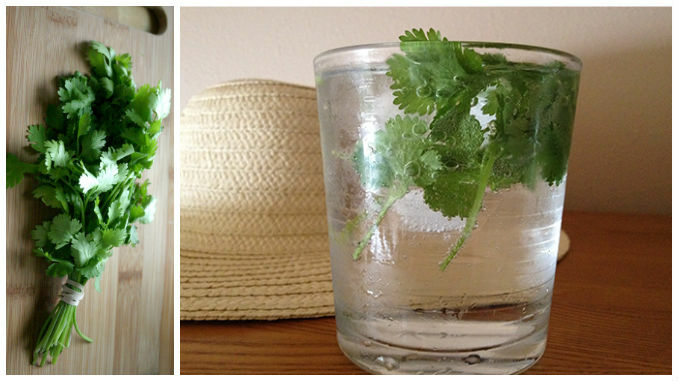 Just a handful of cilantro will clean a pitcher (about 2 liters) of highly contaminated water.